At or near its surface, hair fibers contain a thick protective cover consisting of six to eight layers of flat overlapping scale-like structures called cuticle or scales which consists of high sulfur KAPs, keratin proteins and structural lipids. The cuticle layers surround the cortex, but the cortex contains the major part of the fiber mass. The cortex consists of spindle-shaped cells that are aligned parallel with the fiber axis. Cortical cells consist of both Type I and Type II keratins (IF proteins) and KAP proteins. Coarser hairs often contain one or more loosely packed porous regions called the medulla, located near the center of the fiber. The cell membrane complex, the “glue” that binds or holds all of the cells together, is a highly laminar structure consisting of both structural lipid and protein structures. Hair fibers grow in cycles consisting of three distinct stages called anagen (growth), catagen (transition) and telogen (rest). Each stage is controlled by molecular signals/regulators acting first on stem cells and then on the newly formed cells in the bulb and subsequently higher up in differentiation in the growing fiber. 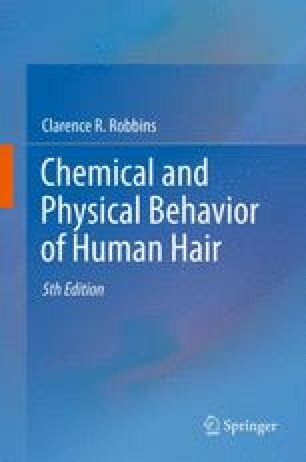 The effects and incidence of hair growth and hair loss (normal and diseased) for both males and females are described in detail. Molecular structures controlling hair fiber curvature (whether a fiber is straight or curly) and the effects of the different structural units of the fiber on stress–strain and swelling behavior are described in detail.